Grayson is 7 months old today!! Clothes: I just packed away ALL the 6 month clothes:( G is in all 9 month clothes! Our sock monkey picture was a little bit harder this month. Grayson never wants to sit still!! He was moving all over the place trying to get out of the glider. This month Grayson has started eating lots of food! I'm still making his baby food & I'm pretty sure he would eat all day if I let him. G is taking 4 bottles a day & eating real food for breakfast, lunch, and dinner. He loves sitting in his high chair at our table and eating food while we eat our meals...he loves being included! So far his favorite foods are carrots, apples, pears, and mango. The only things he hasn't liked are broccoli and yellow squash. I even gave him puffs and cheerios this week...big boy loves them both! Grayson has also been a teething maniac lately. As of today, he has 3 teeth! 2 on the bottom & 1 on top! G is SO close to crawling! He has started diving forward from his sitting position and just rocking on all fours for a few seconds. Then he just belly flops...ha! He really wants to chase the dogs around. Instead of crawling, Grayson just rolls everywhere. He will literally go from one side of the room to the other just by rolling. It's pretty funny! This month we also started letting Grayson bathe like a big kid! He now just gets to sit in the big tub and play with his toys. He loves it! Bath time is his favorite thing! He loves laying on his belly and kicking & flapping his arms. I can't wait to get this kid in a pool this summer! Grayson is still just as happy as ever! He loves school and his teachers. They say that he just rolls around, plays with toys, and jumps in his horsie all day! He is so active & loves playing with all his toys on the floor. His favorite game is still playing tennis ball with Jack...he is obsessed with Jack & loves watching him run after the ball! Happy 7 months, little G! They grow so fast...so fun to watch but sad at the same time! 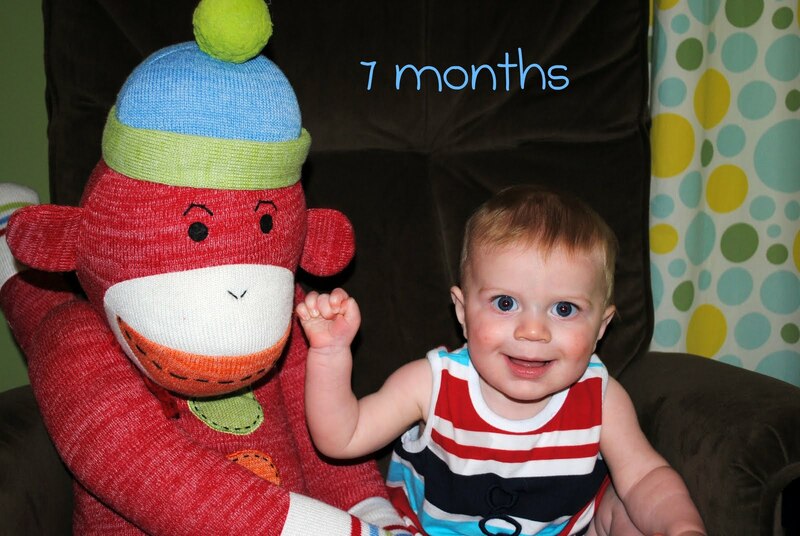 Happy 7 months Grayson! 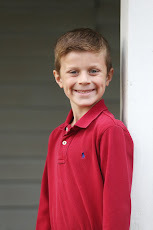 Your little man is so sweet! Happy 7 months!